My first step was to do a little research. After doing a simple Google search, I discovered the Little Free Library website: www.littlefreelibrary.org. This is a non-profit organization that helps both individuals and groups purchase, install, and market their libraries all over the world. They have units for sale and also provide plaques with individual charter numbers for each library to make them easy to locate. I shopped around for units before deciding to buy mine from Etsy. It was cheaper, my desired size, and already assembled by a professional (whose Etsy page has disappeared so I can’t share the site with you) so I knew that it would be sturdy and waterproof. Mine cost less than $200.00 with shipping, but they can run anywhere from $150.00 to well over $1,000.00 depending on the size, shape, and paint job. 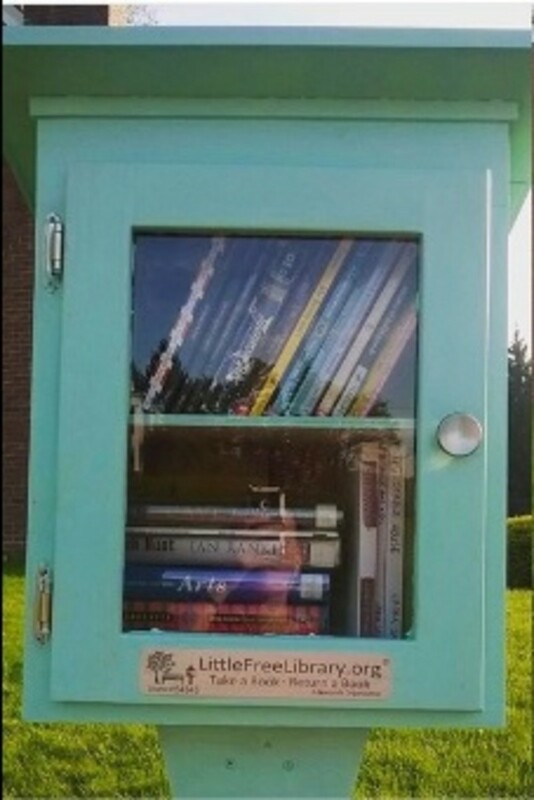 Most libraries come pre-assembled, but The Little Free Library site does have a box available to purchase that you can build yourself. I considered this option but was worried about the quality of the craftsmanship. So, I decided not to take my chances. While the ground was still frozen, my little free library arrived in the mail. So, I got to work gathering the materials I would need to install it. The Etsy box came with all of the hardware and pre-drilled holes that I needed to install it, but it did not come with a post. So, I had to pick one up at Lowes. I also bought it unfinished. 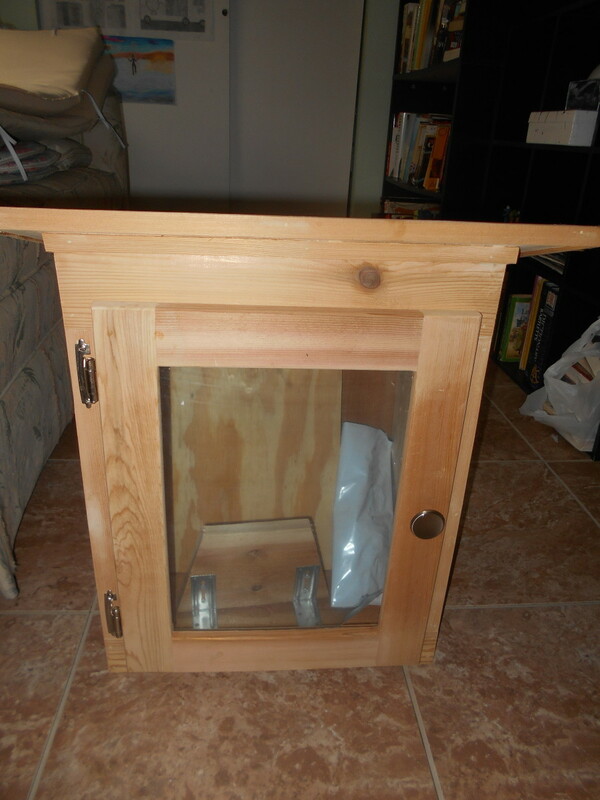 I was originally considering staining the wood a bright color to make it stand it out. Then, I found a small can of outdoor furniture paint in the clearance section at Lowes and decided that would be my color. Armed with some paint brushes and drop cloths, by the time the weather broke, I was ready to paint. Painting took several coats and several days. In my spare room with the windows and doors open for ventilation, I applied three to four layers to the library. The problem with being assembled already was that it was hard to paint around the hinges, knob, and glass without missing a spot or hitting metal or glass. So, some extra small brushes were needed along with some strange painting angles to make sure that I hit every visible area. 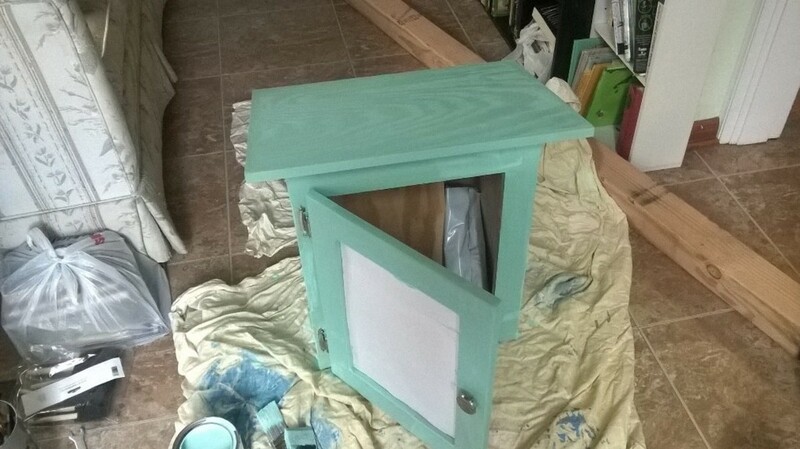 I decided to paint my post the same color as my library so that took some extra time since the post needed to be rotated after a few coats on each side. Afterward, I sprayed it with some outdoor wood protector, but it was still wet after two days, and I did have to touch up my paint after I installed my library which defeated the purpose of spraying. So, I would recommend installing your library before applying any kind of polyurethane or wood protector. About a week after I began painting, my library was ready to install. 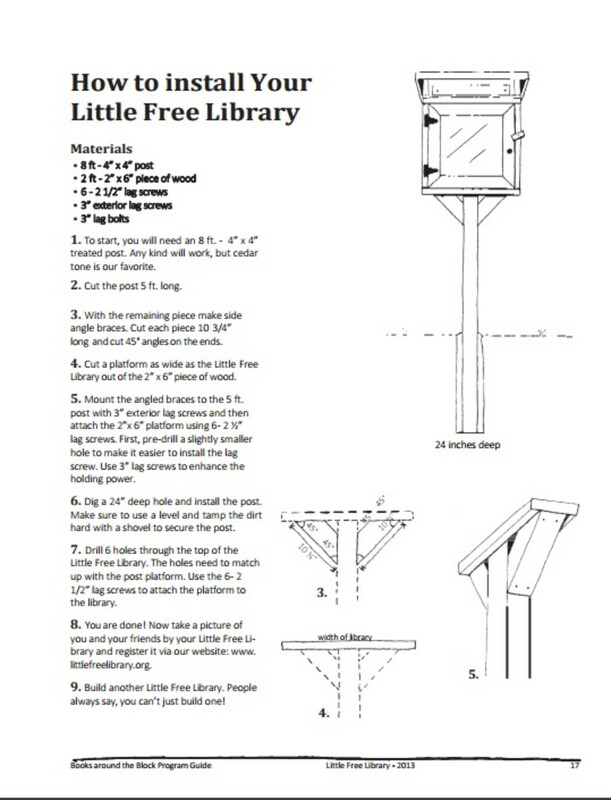 My library came with installation instructions, and the Little Free Library website also has instructions for installation. So, using both sets of instructions and the help of my parents, we dug a hole in the desired spot in my yard. I live on a busy road with no sidewalk so I decided not to install my library in my front yard. I do live on a corner lot, however, so I decided to install it on my less busy side street where cars could stop safely. I also set it back in my yard a few feet so that pedestrians could look through the library without standing in the road. The instructions said to dig a hole two feet deep. We dug down a little over a foot. It made the library sit higher up which is not ideal for children, but an average-sized woman has no problem reaching both shelves. Then, we cut the eight-foot post into a five-foot post using an electric saw that my neighbor had let me borrow for another project. The post was inserted into the hole in the ground, and the library was then fastened to the post on the base that was included with my library. We then used a level to make sure that it was straight and a hand tamper to secure the dirt around the library. Finally, I stocked it with old books: mostly middle grade and young adult novels as well as my self-published novels. A few days later, my plaque arrived in the mail which I secured to the front of the library door with a drill and two screws. Then, I added more dirt and a bit of mulch around the post to help it stand out. Like I said, my library has been a big hit around the neighborhood. Readers come both by car and foot to look through the library, and they have already begun to take and leave books. They have a lot of questions regarding the rules, and basically, aside from common sense anti-vandalism, there are no rules. 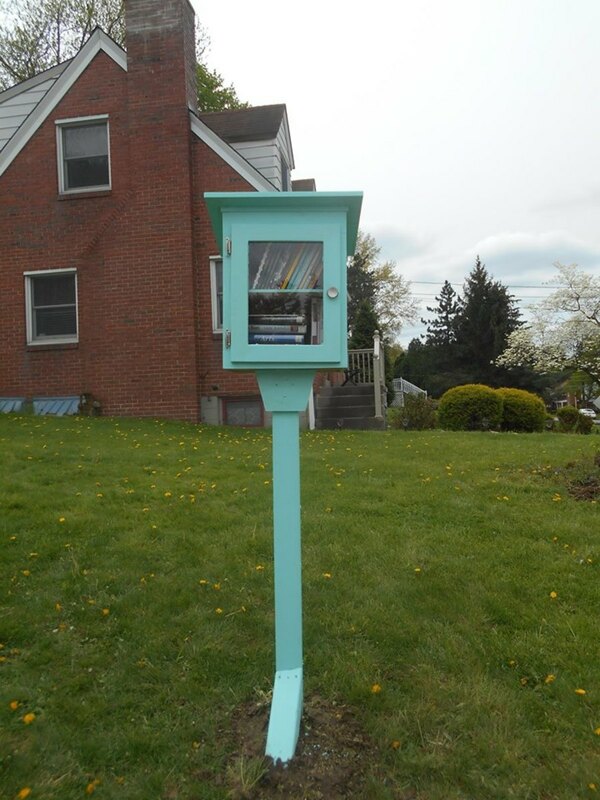 Some say they have been inspired to install one in their yards in order to get rid of their unwanted books. The project has surpassed my expectations already and has added a positive element to both my yard and to the neighborhood itself. 23 months ago from U.S. This is adorable and helpful to local readers! Hats off to you for doing this and sharing books. What a great idea! I will think about this for my own yard. Thanks for the very helpful information.